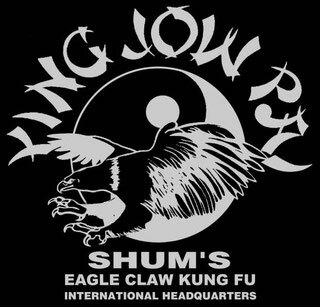 Originally the Eagle Claw system, whose complete history is told in Sifu Shum's book Eagle Claw Kung Fu: Classical Northern Chinese Fist, was called Elephant style, a system of hand combat that Ngok Fei, said to be the most brilliant general of the Southern Song dynasty (1127-1279 AD), taught to his soldiers. The Song court had fled south of the Huai river, a tributary of the Yang Tse River, before the Jürched (a Siberian people who were the ancestors of the Manchus, the last rulers of China before the country became a Republic), who had conquered North China. The Song court set up its capital in Hang Chow. 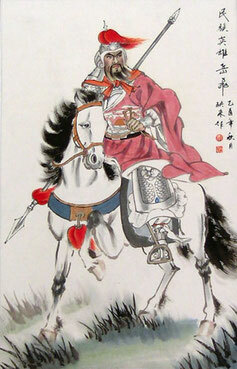 General Ngok Fei defeated the Jürched every time he fought them. Just hearing Ngok Fei's name filled the Jürched with terror. Ngok Fei was able to win victory after victory because he was a clever tactician, and above all because of the kung fu system he taught to his troops. Ngok Fei was a junior officer who rose from the ranks of recruits. He was not only an excellent strategist, but also a scholar and always showed moral integrity and loyalty to the Emperor. He inspired discipline among his troops, won the people's support, succeeded in suppressing bandits who were roaming the land, and defeated the Jürched cavalry with infantry tactics. Unfortunately for Ngok Fei, at that time Prime Minister Ch'in Kwei was working out a peace settlement with the Jürched. Ngok Fei's integrity and popularity were not only jeopardizing the peace accord, but also threatening a shaky regime, the Emperor being a lackluster ruler. Ch'in Kwei falsely accused Ngok Fei of insubordination and convinced the Emperor to order him back to the capital. Ngok Fei, who knew very well what was waiting for him, refused to obey. Three times he disregarded the imperial command. Finally the Emperor sent him a "gold edict" - an order that could not be ignored under penalty of death. Ngok Fei had no choice: he headed back to the capital. Once there, he was immediately thrown into prison where he was murdered. He was thirty-nine. It is widely believed that Ch'in Kwei engineered Ngok Fei's murder. Ngok Fei's soldiers, enraged at the grossly unfair punishment he had suffered, disbanded and continued training on their own. A monk named Lai Chin, who was already the master of his own system called Faan Tzi, happened to see Ngok Fei's former soldiers training during his travels. He recognized the value of their techniques and decided to incorporate them into his own system. Faan Tzi Eagle Claw was born: today it is known as the Northern Eagle Claw system. 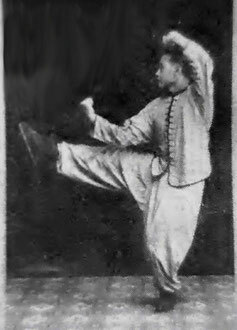 Lai Chin taught Northern Eagle Claw to his student, another monk named Toa Gai, who in turn passed it on to one of his lay students, Lau Shing Yuo. The latter trained his son, Lau Kai Man, in the system. Originally, the Northern Eagle Claw system was to remain within the Lau clan and was not to be taught to outsiders. But Lau Kai Man taught it not only to his nephew in the Lau family, Lau Fat Man, but also to Chan Tzi Ching, his sister's son. 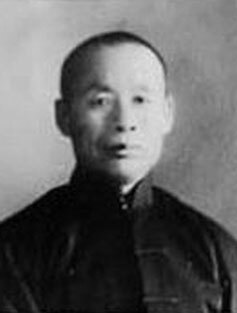 Chan Tzi Ching founded the Ching Mo Kung Fu Association in Shanghai with his friend, Fawk Yun Gop. Other sifus soon joined the association. 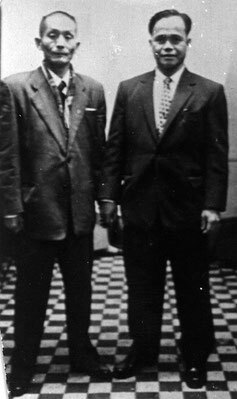 Chan Tzi Ching also went to Hong Kong to set up another Ching Mo Association, but he soon had to return to Shanghai and left the Hong Kong Ching Mo Association in the care of Lau Fat Man. 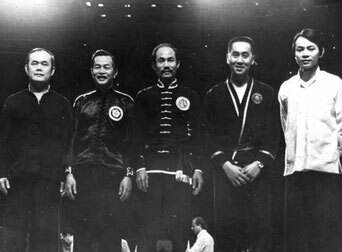 Sifu Shum's teacher (our Sigong), Ng Wai Nung, trained extensively under Lau Fat Man. During the Sino-Japanese War (1937-1945), the Hong Kong Ching Mo Association was closed. Lau Fat Man spent the war teaching in Canton with Ng Wai Nung. After the war, Lau Fat Man went back to Hong Kong and taught for five years in the Restaurant Workers' Union. 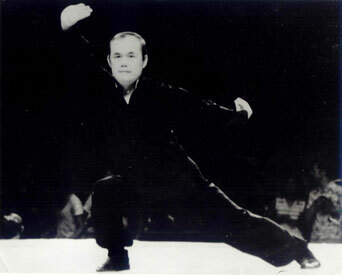 Ng Wai Nung also came back and taught in an opera actors' club and gave private lessons in both kung fu and tai chi. Later Ng Wai Nung opened a school on Tai Po Road in Kowloon, where he taught until his death in 1992. Great-Grandmaster Lau Fat Man also opened a school and later taught privately until his death in the mid-1960's. His daughters, Lily and Gini Lau still carry on their father’s art. The school stayed at 28th Street for five years, with its students performing extensively in that time. In 1974, students went to Washington, D.C. to take part in a competition sponsored by Dean Chin, and to Puerto Rico for a demonstration there. Later, performances took place at Madison Square Garden and Town Hall, both in New York City. In 1975, less than one year after the opening of the school, thirty Eagle Claw students organized demonstrations in New York's Lincoln Center, Staten Island College and Queens College. 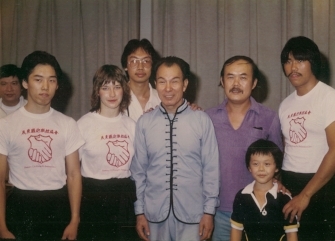 In the course of 1975 Eagle Claw students performed several times in Boston, once for the opening of the Boston branch of the Eastern U.S. Kung Fu Federation. In 1979 the school moved to a larger space at 34th Street and 9th Avenue, where it stayed for nine years. Even in the new location, classes were crowded and had to be split into early and late sessions. Every day, up to twenty new people would come in to observe classes, many of them eventually signing up for them. A large number of students came from abroad, including Korea, Germany, Great Britain and The Netherlands, to train with Sifu Shum. With so many students, Sifu Shum started to train a number of his senior students, including Cecil Jordan, Benson Lee, David Chin, Mark Shan and Peter Armstrong, to teach beginners. 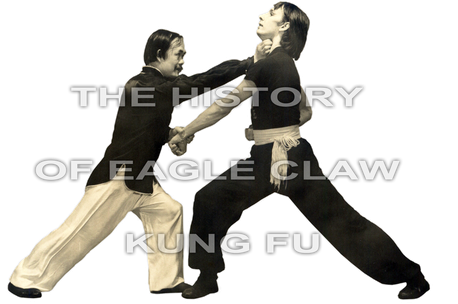 It was also during that time that Sifu Shum's kung fu book, Eagle Claw Kung Fu: Classical Northern Chinese Fist, was published, which in turn drew more students to the school. 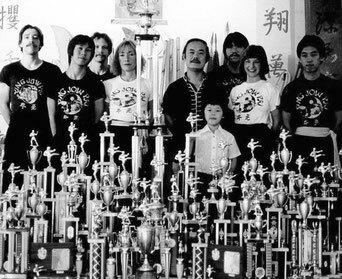 Some outstanding Eagle Claw students such as Benson Lee, who won the title of grand champion several times for forms, and Cynthia Rothrock helped spread the name and fame of the Northern Eagle Claw system. 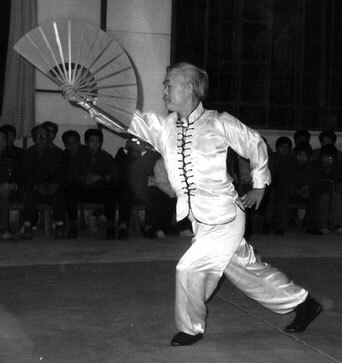 During this time Sifu Shum continued holding a Chinese New Year party each year. Performances opened with Southern and Northern lion dancing and continued with demonstrations of Eagle Claw fist forms, various weapons, partner forms and tai chi forms. Because Sifu Shum required the best from his students, and they were willing to spend long hours rehearsing, the New Year's performances were outstanding. Many sifus from other schools and their students were also invited to perform. The audience, students, family members, friends, and visitors regularly exceeded four hundred persons. Starting in 1988 the school was forced to move several times due to the volatile real estate market in New York City. The headquarters school now resides in Manhattan Chinatown and although Sifu Shum is retired he still goes once a week to oversee and teach at the school. 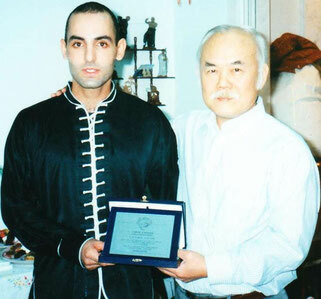 In 2009 Grandmaster Leung Shum appointed six 1st generation disciples to develop the future and preserve the essence of Shum's Ying Jow Pai and Wu style Tai Chi Chuan. 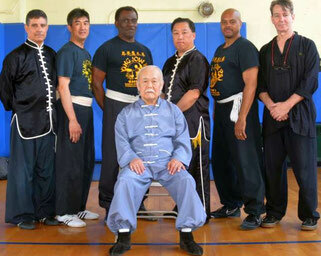 Ghee Tsang, Cecil Jordan, Benson Lee, Frank Marrero, Julio Perez and Lenny Aaron.